Rush's musical style changed substantially over the years. Its debut album was strongly influenced by British blues-based hard rock: an amalgam of sounds and styles from such rock bands as Black Sabbath, the Who, Cream, and Led Zeppelin. Rush became increasingly influenced by bands of the British progressive rock movement of the mid-1970s, especially Genesis, Yes, and Jethro Tull. In the tradition of progressive rock, Rush wrote extended songs with irregular and shifting time signatures, combined with fantasy and science fiction-themed lyrics. In the 1980s, Rush merged their sound with the trends of this period, experimenting with new wave, reggae, and pop rock. This period included the band's most extensive use of instruments such as synthesizers, sequencers, and electronic percussion. In the early 1990s, the band transformed their style once again to return to a more grounded hard rock style and simultaneously harmonize with the alternative rock movement. Geddy Lee's high-register vocal style has always been a signature of the band ��� and sometimes a focal point for criticism, especially during the early years of Rush's career when Lee's vocals were high-pitched, with a strong likeness to other singers like Robert Plant of Led Zeppelin. A review in The New York Times opined Lee's voice "suggests a munchkin giving a sermon". Although his voice has softened, it is often described as a "wail". His instrumental abilities, on the other hand, are rarely criticized. He has cited Jeff Berlin, Jack Casady, John Entwistle, Jack Bruce and Chris Squire as the bassists who had the biggest impact on his playing style. Lee's style, technique, and ability on the bass guitar have been influential to rock and heavy metal musicians, inspiring players including Steve Harris, John Myung, Les Claypool, and Cliff Burton. Lee is able to operate various pieces of instrumentation simultaneously during live concert, most evidently when Lee plays bass and keyboards, sings, and triggers foot pedals as in the song "Tom Sawyer". During his adolescent years, he was influenced by Jimi Hendrix, Pete Townshend, Jeff Beck, Eric Clapton and Jimmy Page. Lifeson incorporated touches of Spanish and classical music into Rush's sound during the 1970s, reflecting his interest in progressive rock guitarists like Steve Hackett and Steve Howe. To adapt to Lee's expanding use of synthesizers in the 1980s, Lifeson took inspiration from guitarists like Andy Summers of The Police and The Edge of U2, who gave him models for rethinking the guitar's role in Rush's music. Lifeson's guitar returned to the forefront in the 1990s, and especially on Vapor Trails (2002). During live performances, he was responsible for cuing various guitar effects, the use of bass-pedal synthesizers and backing vocals. ^ Krewen, Nick (September 5, 2012). 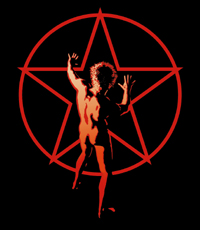 "The Spirit of Rush". GRAMMY.com. Retrieved February 7, 2017. ^ "Rush's Alex Lifeson: 'We've Committed To Taking About A Year Off'". BLABBERMOUTH.NET. November 18, 2013. Retrieved November 25, 2014. ^ "RUSH Kicks off 'R40 Live' 40th-Anniversary Tour In Tulsa; Video Footage, Photos". Blabbermouth.net. May 9, 2015. Retrieved August 11, 2015. ^ a b Niester, Alan (1979). "Rush". In Marsh, David; Swanson, John (eds.). Rolling Stone Record Guide. Random House / Rolling Stone Press. p. 336. Retrieved October 5, 2016. This Canadian power trio, which boasts a vocalist who sounds like a cross between Donald Duck and Robert Plant, reached its pinnacle of success the day it was discovered by Circus magazine and turned into fanzine wall-decoration material. Rush is to the late Seventies what Grand Funk was to the early Seventies – the power boogie band for the 16 magazine graduating class."